When you were in school, what was your favourite new school thing to get at the beginning of the school year? I loved getting a box of colouring pencils. :D I also loved the sound they make when you put them all into your pencil bag. I still love it. I have so many pencils but i have no idea what to do with them, hehe. What new thing did you love to get? Oh a new pen – always I had to have a new pen. And a new bottle of blue ink. School paste. Anybody else old enough to remember the jars of School paste you could eat like cake frosting? Any art supplies. I was always really excited about brand new notebooks, too. Pencils, pens and absolute favourite was erasers of different shapes and sizes which I never wanted to use so as not to spoil them! Ah, those days! I love, love, love to buy school supplies. Still to this day. My favorites are the promise of fresh, clean notebooks. The binder. Like the Mead Trapper Keeper. The clear plastic coating was especially great because you could tear a small hole in the corner, blow air into it, and use it as a pillow. When the hole got too big to hold air you could slit the top and put in any cover “artwork” that you wanted. A new binder! Fresh paper, tabs, the whole organizing and labeling process… Then there was the new 3 ring pen/pencil holder… Heck, it still makes me happy just to think about it. You know what? I think I’m going to buy myself some school supplies today just to bring back that wonderful feeling! I loved markers. Markers are still my favorite. Lately, both my favourite and least favourite item to purchase is textbooks. I’ve accumulated a wonderful library since attending university… a wonderful, expensive library. Notebooks and new pencil holders. The smell of certain knds of plastic takes me back to those cool pencil holders to this day! I LOVED organizing all my paper and stuff…. A new friend. The vast majority of us grew up together from kindergarten through high school graduation. Having someone move into town and join the school was exciting and fresh; they were able to share tales about life outside of our little town. New shoes. I’m not the type of girl that is obsessed with shoes nowadays but as a kid I loved getting new shoes because every year my shoes made me feel more and more grown up! A new lunchbox. Very difficult to choose what lunchbox says “me”, and always interesting to see what other kids at school chose the same one. @Leanne1986 I remember one year getting oxford-type looking shoes, only they were red and blue, and had a big red suede apple on the tops of them. I loved those shoes! @filmfann The lunch boxes WE had would probably be collectors items now….Dr. Doolittle and lassie and flipper. Metal. Nothing. I hated back-to-school shopping. I would scream in agony at the first BTS commercial I saw. @Dutchess_III The real collectors item would be an intact thermos. I don’t remember one of those lasting thru the year without breaking the glass inside. 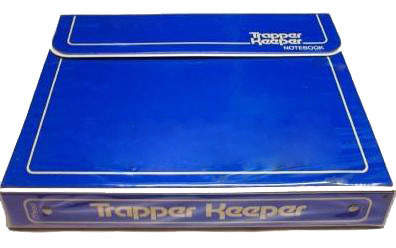 Every year, I got a new Trapper Keeper. New shoes and that pair had to last all year… Unlike @Leanne1986 today, I am a shoe fanatic. We always got a box of 24 pencils. I thought that was so fun. We only got a new notebook if our old one was completely trashed. But we always got a new package of looseleaf paper. This is very simple compared to what was required for my own children’s supplies for the new school year. But I have the memory of being so happy with my new school supplies so many years ago. @filmfann re: thermoses: Unbroken ones would be one that never held chocolate milk! Never held a mother’s attention to her kids who wanted chocolate milk rather than white milk. What kind of collector’s item would THAT be? But yeah, you’re right. I’ll never forget the first time I heard that glass rattling around. It was “Oh crap! I broke it!” But….I never got in trouble…. Who gets ownership of the moon? What is something that recently caused you to think, hey, I could do that better? Why do schools start so early now? Is frat college life really all that fun ? How was your Fraternity experience? Did you know that it is National Goof Off Day?